Audience: This project brief was written for senior management—VP and above—approval. Completely redesign the My Disney Vacation (MDV) section of disneyworld to be less Business focused and more Guest-centric. Decrease Guest site frustration and increase Guest registration. Streamline the registration process and improve Guest satisfaction. Make MDV customizable and personal. Project Brief was green lit by senior management stakeholders. An improved, Guest-centric site, and a site that pleased senior leaders. It was on this project that I started annotating wireframes and comps, in an attempt to put copy in context. I insisted copy was represented during early design and scope meetings. 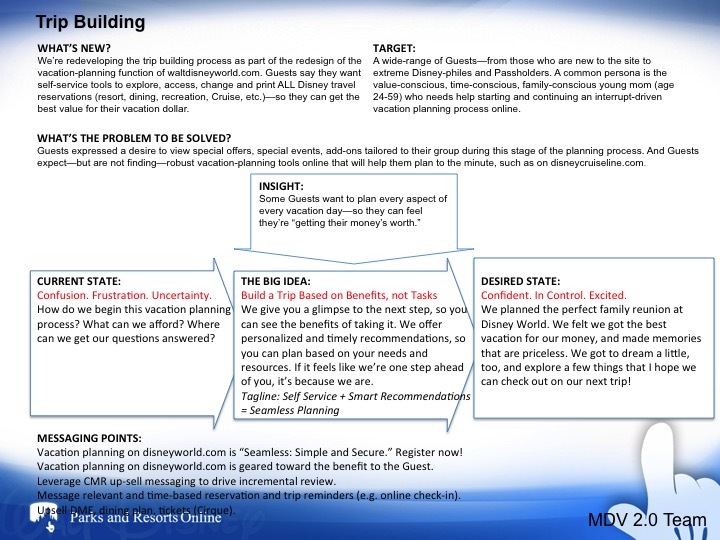 Thinking and design that begin with MDV redesign extended to the WDW Next Gen prag-magic copy style and my copy vision. 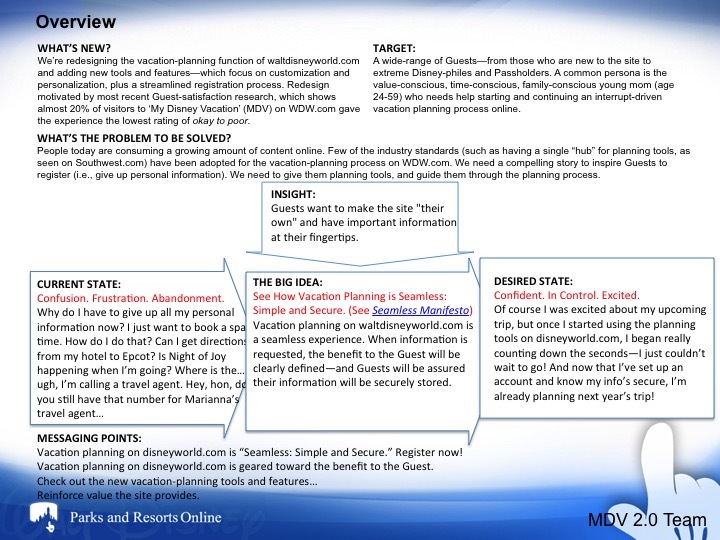 Part of the MDV redesign included a redesign of Backstage Pass (BSP). This was the time we said goodbye to Donald Duck and welcomed Chip 'n' Dale as the hosts of the BSP interactive section of the site. “You have taken the lead in writing MDV 2.0. You’ve been a primary participant in an unparalleled process of collaboration new to WDPRO. And the results have been extremely positive from the viewpoints of both your WDPRO MDV team members and the Brand. Clearly, your work on MDV using an unprecedented process has displayed indications that it’s a process that might be adaptable for other projects. Your taking charge as the point person and your awareness of the processes—both old and new—is greatly appreciated. And your writing for all the projects this year has been at your usual high quality. Focus on the ‘benefit to Guest’. This is the core, the seed, the foundation of MDV 2.0—the No 1 point in the Seamless Manifesto. David says ‘organized,’ Dan says ‘be relevant,’ I say ‘simple.’ We're all saying the same thing. One issue that’s getting lost is that of “security.” I know there’s some actual research to show that Guests are reluctant to relinquish personal information on websites. This is a huge hurdle to overcome—something that will drive such elements as copy. I like Eric’s suggestion of breaking down the tagline, or the briefs, into the different disciplines. Perhaps this is where ‘security’ could show up and be defined as it relates to the problems of this project. The focus is on Guest benefits, not Guest tasks. The benefit to the Guest is clearly defined upfront when a Guest is asked to reveal personal information. Security of Guest information is guarded and protected. Guest data is collected, securely stored, managed and communicated transparently. Copy elements assure and reassure Guests of their safety on Disney websites. Simplicity is inherent in "seamless." Navigation is obvious and transparent. Guests can easily find the information they want first and foremost, such as location, price, age range and experience description. No Guests should wonder where to find the next step, the next piece of information, or the help they need. Products and services are described in terms first-timers instantly understand and repeaters instantly recognize. Media elements are informative and actionable, and are directly and obviously attached to products and services Guests may book, buy or arrange. Media elements and copy elements are directly and obviously related. The voice is simple, direct and friendly -- never too clever, coy or confusing. The tone is "host," not "task master." Guests feel like they're attending a dinner party, not a tax audit. Guests understand that vacation planning on disneyworld.com is "Seamless: Simple and Secure." Guests leave their online vacation-planning experience feeling more excited than ever about their upcoming Walt Disney World vacation.